What Goldline doesn’t say upfront is that for its own bottom line, collector coins are a lot more lucrative than mere bullion. Profits in the coin business are based on “spread,” the difference between the price at which a coin is sold and the price at which the dealer will buy it back. Most coin dealers, including Goldline, will sell a one-ounce bullion coin for about 5 percent more than they’ll buy it back for, a figure that closely tracks the price of an ounce of gold on the commodities markets. That 5 percent spread doesn’t leave a lot of room for profits, much less running dozens of ads a week on national radio and cable programs, with endorsements by everyone from Beck to Mike Huckabee, Fred Thompson, and Dennis Miller. So, Goldline rewards its salespeople for persuading would-be bullion buyers to purchase something with a bigger markup. 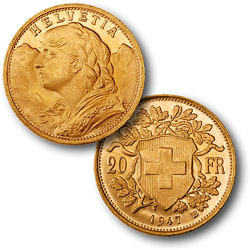 Twenty-franc Swiss coins are a little smaller than a nickel and contain a little less than two-tenths of an ounce of gold. The coins are about 60 to 110 years old and not especially hard to find (though Goldline describes them as “rare”). They are not fully considered collectors’ items nor commodities, making their value more subjective than bullion’s. Goldline sets a 30 to 35 percent “spread” on the coins, meaning that it will pay $375 to buy back coins it’s currently selling for $500. At that rate, gold prices would have to jump by a third just for customers to recoup their investment, never mind making a profit. Investing in Goldline’s 20 francs would be like buying a blue chip stock that lost a third of its value the minute it’s purchased. It’s difficult to think of any other investment that loses so much value almost instantly. So what persuades people to buy anyway? The short answer is: a hard sell from the Goldline sales force. For the long answer, click the link and read Stephanie’s investigation into the tangled and abusive web between Beck, Goldline, conservative talk radio, and their all-too-credulous customers. It’s not a pretty story.